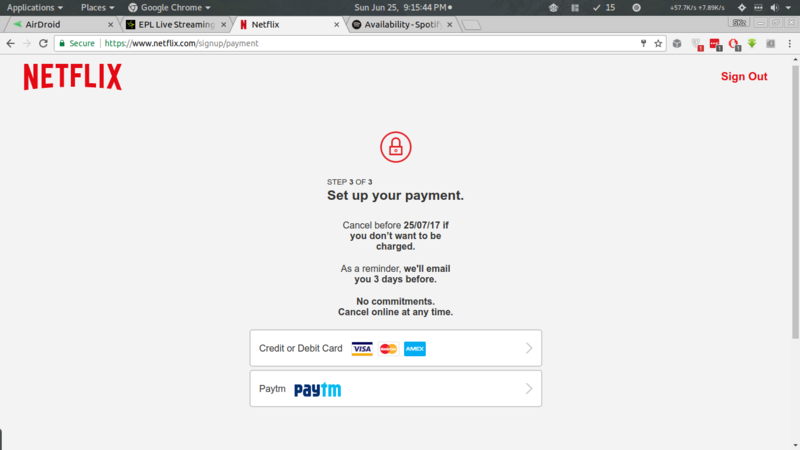 Netflix starts complying with RBI's two-factor authentication rules; testing Paytm? Netflix has started complying with the RBI’s 2-factor-authentication norms for authenticating credit and debit cards issued in India. While cards issued by Visa and MasterCard are being authenticated through an Indian payment gateway service, American Express cards, even those issued in India, don’t go through similar authentication. Comment from discussion TIL we can use PayTM to pay Netflix. MediaNama has reached out to Netflix and Paytm for comment, and will update when we hear from them. Last year, when Netflix first came out in India, we pointed out that it was flouting RBI regulations by not verifying credit and debit cards issued in India (some disagreed), as required by the central bank even for international transactions. Since then, the company seems to have silently begun compliance with this requirement, similar to their absorption of a service tax imposed on digital goods last December; Netflix absorbed the tax so that they wouldn’t have to change their pricing in India, and they have similarly not changed pricing after GST was implemented at the beginning of this month. In 2014, Uber faced similar issues as the app was charging users’ credit cards without a second layer of authentication, which is allowed in most other countries where Uber operates. In a visibly frustrated post titled ‘Uber is Now Compliant but Less Convenient’, the company called India’s 2FA rules “an antiquated solution that is cumbersome for consumers and stifling for businesses”. Uber has since incorporated 2FA in its app for India, but users only need to authorize payment before their next ride.